it can convert 3d coordinates to 2d screen space and screen coordinates to 3d world coordinates. a good tool that would work well with this dll is blender2gml. Edited by doug25, 22 November 2009 - 06:10 AM. This dll looks extremely useful. However, I never do 3D development. So this would allow you to "click" 3D objects within the game, right? Please use a file host like skydrive or host-a.net. There is no download link in the page you refer. only ads to create an account. Edited by icuurd12b42, 18 November 2009 - 05:57 AM. sorry, the download link did look like an ad, i didn't realize there was a link either when i first used that site. Change the aspect ratio of your projection so it dont match your screen/window and you will see what I mean. Edited by icuurd12b42, 18 November 2009 - 11:28 PM. by calling Ex3d_setViewport(room_width, room_height..), this tells the dll to set the aspect ratio to room_width / room_height. but i don't think that's the problem. what i've noticed is that when i change the room size, for some reason mouse_x is always from 0 to 640 inside the room and mouse_y 0 to 480. this means that the mouse doesn't correspond correctly with the viewport, know what i mean ?, so by modifying the code to Ex3d_get3dCoord(mouse_x*(room_width/640),mouse_y*(room_height/480),0); the correct 3d coordinate will be retrieved for whatever room dimension is set. i don't know why mouse_x and mouse_y always output values of a 640 by 480 room ? //This function is called every draw of the camera. That setViewport function is meaningless (as far as I know, unless you want to limit the calculation inside that box???) in your 3d stuff. only the aspect ratio is. 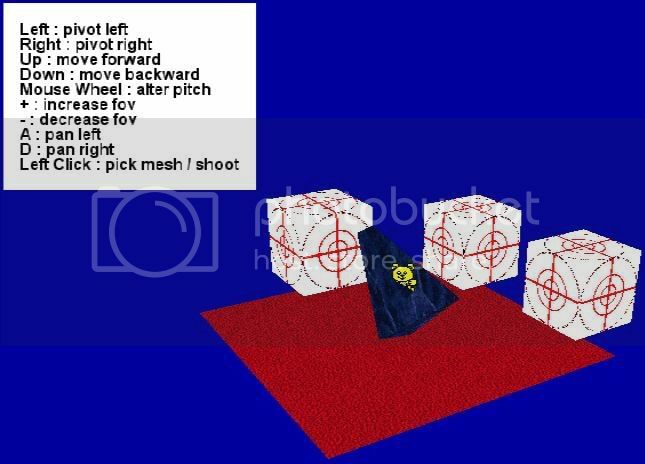 and where the camera is located (x,y,z), pointing (direction vector, vx,vy,vz), it's lens angle and aspect ratio. You should have a functions to get the normalized vector dx,dy,dz relative to the mouse too, like the code above. That is useful for shooting stuff towards where the mouse points to. The direction vector where the camara points too, we already know, but it would be usedful to get the normalized vector to that too. Edited by icuurd12b42, 19 November 2009 - 04:35 AM. the reason for the setViewport function was really because D3DXVec3Project requires a D3DVIEWPORT9 passed to it, but i don't imagine this will be a problem having the viewport structure's width and height set to the view width and height, it seems to work well. Once in a blue moon people may change the lens angle or the aspect ratio (which should usually be the same as you viewport on screen, not the view in room BTW, though usually they have the same values) in order to create some effects like say a sniper zoom. That is why you should not take the width and height of the view or room into consideration... I mean directly. Like I stated, you should provide a parameter to change those directly via a lens and aspect ratio parameter or function and you leave your users the responsibility to calculate it. i don't quite get what you mean by changing the view via a lens and aspect ratio ? the view in room view is default to 640x480 and so is the port size. Good job. I'll be sure to remember this little dll. Edited by icuurd12b42, 22 November 2009 - 07:25 AM. i've made it so you can set the aspect ratio using setAspectRatio and the window (viewport) size can be set in game maker (window_set_rectangle, Ex3d_updateViewport(window_handle)), i think that should cater for the camera effects you are referring to ? did you extract the zip file ? and this causes the working directory for the game to be different from the dll's directory. does that solve the problem ?